There are fossils in New York’s Grand Central Station. It’s not a traveling museum exhibit. It’s not an exhibit at all. Hundreds of millions of years in the past, the limestone used to construct the station’s floors was formed through the accumulation of ancient marine life. You can still see impressions of some of those life forms today if you know what to look for. The episode airs this Saturday, Nov. 23 on ABC television stations. 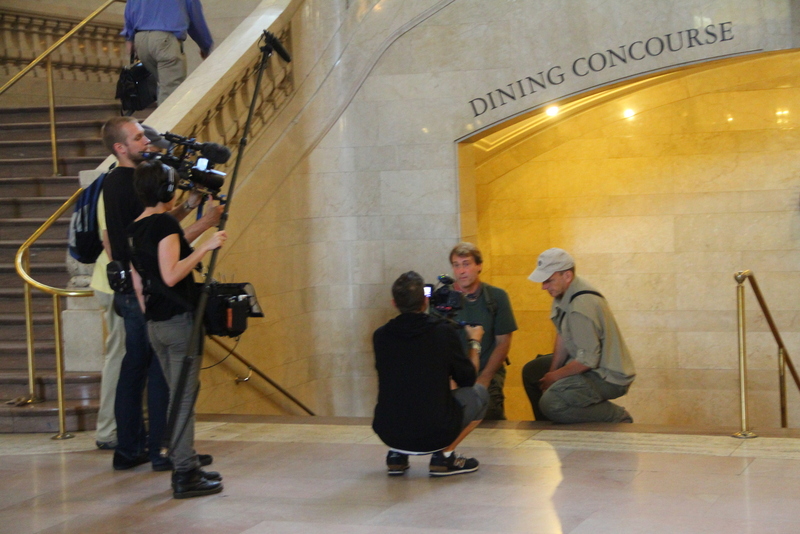 In two days of filming this summer, Lacovara and Wiese found fossils not only in the floor of Grand Central, but in the wall of Saks Fifth Avenue department store, the Bronx Courthouse, the Brooklyn Library, on the beach in Queens and at the tip of Staten Island. Lacovara said the episode aims to link people to their ancient past and show that evidence of Earth’s rich history is all around us. “Born to Explore” airs Saturdays on ABC stations nationwide. In Philadelphia, it airs on WPVI-TV(6-abc) at 11 a.m. Additional local listings are here. New York City made a great setting to find fossils hiding in plain sight – but it’s hardly the only place to look. How do you find a fossil in a building façade? Lacovara said most fossils that appear in building façades will be invertebrates, such as clams, brachiopods (which look like clams, but are not related), corals, bryozoans (which look like corals, but are not related), crinoids (echinoderms that look like hollow tubes in rock), and other small marine life forms. Ready for your own urban fossil foraging? Watch “Born to Explore” this weekend for more tips, and happy hunting!